MI-BOX Moving & Mobile Storage offers the most advanced portable storage technology. Our Level Lift System protects your contents from damage. Our mobile storage containers are the most durable and longest lasting containers available. 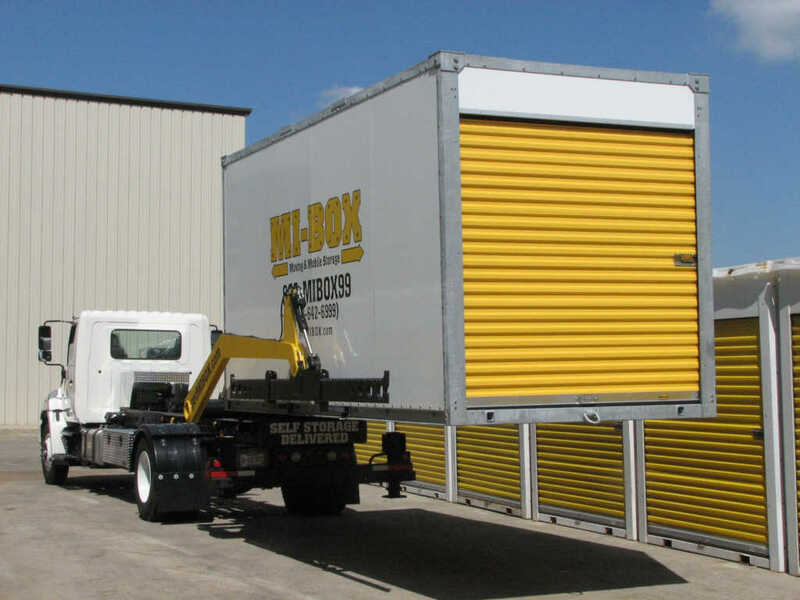 When you use MI-BOX mobile storage units for your home or business storage needs, you'll experience many things that set us apart from other mobile and traditional storage options. Personalized service, locally owned, competitive prices, industry knowledge, and years of experience provide our customers with the best possible moving and storage experience. Experience The MI-BOX Advantage. Professional service is what you can expect from all MI-BOX dealers. Each location is locally owned and operated. Our owners work and play in the communities they serve. We all have family and friends who rely on us to get the job done right the first time. As a MI-BOX customer, you can expect the same family service every time. The MI-BOX Level Lift System ensures that your storage unit will remain level through delivery, transport and pick-up. This protects your valuables from damage caused by shifting contents. It can gently place each storage unit where you want it, without damaging your driveway. The MI-BOX Level Lift System is patented technology and only used by MI-BOX dealers. Get hassle-free delivery. Get MI-BOX. MI-BOX storage containers can be used at home, at the office, during events, at construction sites, during remodeling projects, or anywhere else you need secure, weathertight, convenient storage. MI-BOX storage units come in 8', 16', and 20' lengths. There great for any size moving or storage job. Rent only the space you need and get on time delivery. BIG or small, MI-BOX does it all. Each mobile storage unit is built to last a life time. Frames are hot dipped galvanized steel to prevent rust damage on your driveway. Composite wall panels are used to keep your belongings safe and dry. The form fitted roof is securely fastened to the storage container to ensure your valuables stay secure and dry. You can choose from our 8’ x 8’, 16’ x 8’ or 20’ x 8’ moving and storage unit. They are delivered with our Level Lift System and fit in standard parking lot spaces and driveways. Combine sizes for any size job. All containers are 7 ft. 2 in. wide and 8 ft. 4 in. high (exterior dimensions). Need the unit at home? Not a problem – we can leave it on-site at your location. Not sure if you have room at your location but need long-term storage? That’s ok, we'll pick it up and store it at our secure storage centers. Moving across town? We've go that covered too! MI-BOX will deliver it to your new home. It's just that easy. Every MI-BOX dealer throughout the United States and Canada is attentive to your needs. We are experts in portable storage and moving. We'll provide cost effective and convenient options that best fit your needs. You won’t end up in an automated maze trying to find a person to talk to – MI-BOX is locally owned and operated and here for you!